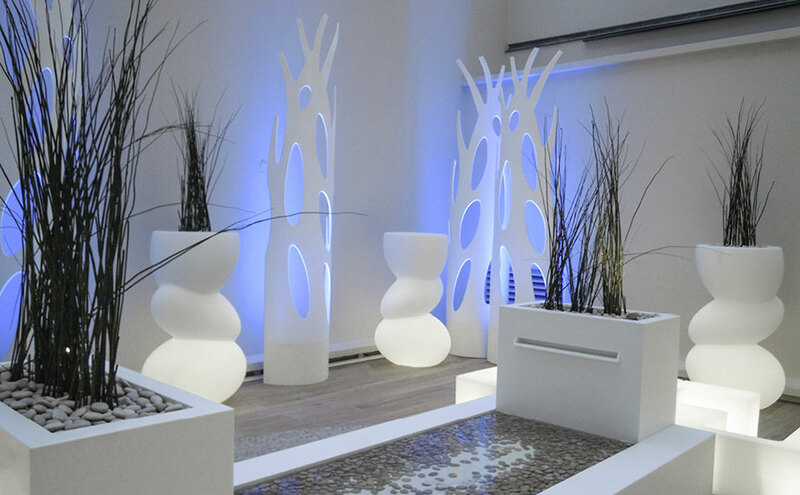 Architect Pierre Lemeur was in charge of leading the terrace Project for the Societé XL Insurance insurance company, in which the Quasar´t Créations studio also participated as designers of part of the furniture, and for which Liberty Ligne transformed the compact mineral from PORCELANOSA Group, KRION®. The impact of KRION® within the space is especially significant, as all the beauty that the room contains is surrounded by our material KRION® in an original and fresh form. It seems difficult to think that this area which allows employees to relax and breathe fresh air is at the centre of the bustling city of Paris. At the centre of the space we can find a fountain with cubic forms fully covered with 1100 Snow White, the same KRION® material that covers the rest of the elements in the space, such as the five curved, milled totems which suggest the forms of plants, and the original covering of the metallic structure, allowing the employees to use the terrace even in inclement weather. Overall, this is a project created with KRION® which does not go unnoticed.